A trio of Metallica fans have been given exclusive access to the band’s HQ. The three of them won a recent competition which the band ran in conjunction with Ernie Ball. 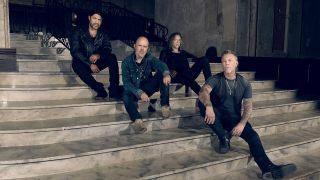 The lucky winners were given a guided tour of the band’s inner sanctum by guitarist Kirk Hammett and vocalist and guitarist James Hetfield. Last week, Hammett reported that he still believed that Metallica were right to sue music streaming service Napster back in 2000.